The new skate park facility will include a skate bowl and plaza, social spaces and high quality landscaping. 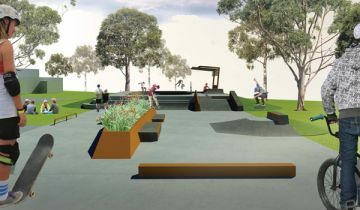 It will also cater to more users – from beginners through to advanced skateboarders, BMXers and WCMX (wheelchair) riders, and provide a safer and more inclusive space for all. Minister for Lands and Forestry Paul Toole said the PRMF program is providing vital support for the development of Griffith’s youth precinct. “The PRMF program provides support to Trust managers to maintain, protect and improve our Crown reserves for the benefit of the entire community,” Mr Toole said. Work on the skate park is expected to begin on 20 April and, weather permitting, should be finished by the end of June 2018.